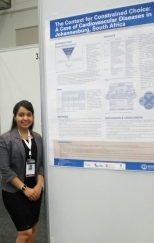 Several researchers raised the HSRC flag at the prestigious International Population Conference (IPC), by presenting pertinent findings from their work. Statistics South Africa, on behalf of the Republic of South Africa, recently hosted the 28th IPC of the International Union for the Scientific Study of Population (IUSSP) at the Cape Town International Conference Centre from 29 October to 4 November 2017. Read more about IUSSP and the IPC here. The IPC is an esteemed international event drawing over 2 000 scientists, policy makers and practitioners in the global population community to meet, engage and address issues of common concern. The conference takes place once every four years to provide an innovative forum for researchers to reflect on population health issues and to debate possible actions and policy responses to the emerging challenges. The conference welcomed delegates from over 135 countries in over 240 scientific sessions featuring the results of recent research from across the globe. Presentation sessions covered a wide range of topics including poverty and inequality, population and environment interactions, sexual and reproductive health, international migration, the consequences of population ageing and issues related to children and youth, education, the labour force, and gender and human rights. There were also sessions on Population and Migration research and policy challenges in Africa. A unifying theme that cut across all sessions was that of the advances in methods of measuring population dynamics, and in the collection and analysis of data. Particular emphasis was evident in respect of evaluating progress towards achievement of the health, education, social cohesion and other development goals of the SDGs. This was the first conference hosted in sub-Saharan Africa. Prominent speakers included Naledi Pandor (Minister of Science and Technology), Jeff Radebe (Minister of Planning, Monitoring and Evaluation) and Pali Lehohla (recently retired Statistician-General of South Africa). 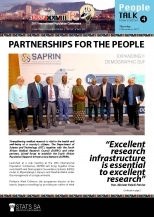 The HSRC researchers who participated included Dr Priya Buldeo (PHHSI) (Cardiovascular Diseases in Johannesburg); Dr Stephen Rule (RIA) (Circular migration between Eastern Zimbabwe and Johannesburg); and Prof Monde Makiwane (HSD) (Intergenerational Relations in SA). The conference provided networking opportunities with researchers from countries as diverse as Brazil, India, China, Bangladesh, Algeria, Ghana, Germany, Spain, Canada, and Fiji. In addition, there were exhibits, side meetings and training sessions by universities, research institutions and academic publishers including HSRC Press.